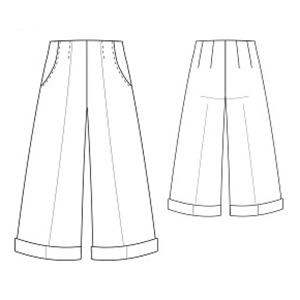 Wide-leg, mid-calf length culottes have a semi-tailored fit, with a center-back zipper, a grown-on & self-faced waist, plus double darts at the back for a superior fit. Fronts feature angled pockets and a deep pleat, stitched down to the waist for a flattering silhouette; we recommend pressing in a center front & back crease to make the turned-up hems super-chic. Team these fabulous camera-ready culottes with a matching blazer, moto or bomber jacket for a modern take on the classic pants suit; try them with a boxy or slouchy top worn untucked over the waist; or tuck in a pretty blouse and add a waistcoat for a dressed-up boho look. 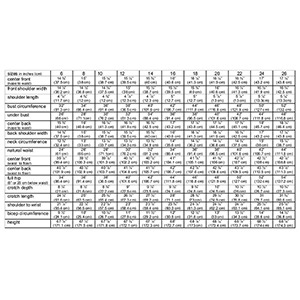 Suggested fabrics are bottom-weight woven fabric with or without stretch such as twill and denim, broadcloth, poplin, tencel, wool, or suiting. 2 3/4 yard for all sizes.